In 1995, the suitcases of patients who once occupied the Willard Asylum between the years of 1910 and 1960 were found piled up behind a plastered-in section of the Asylum attic. 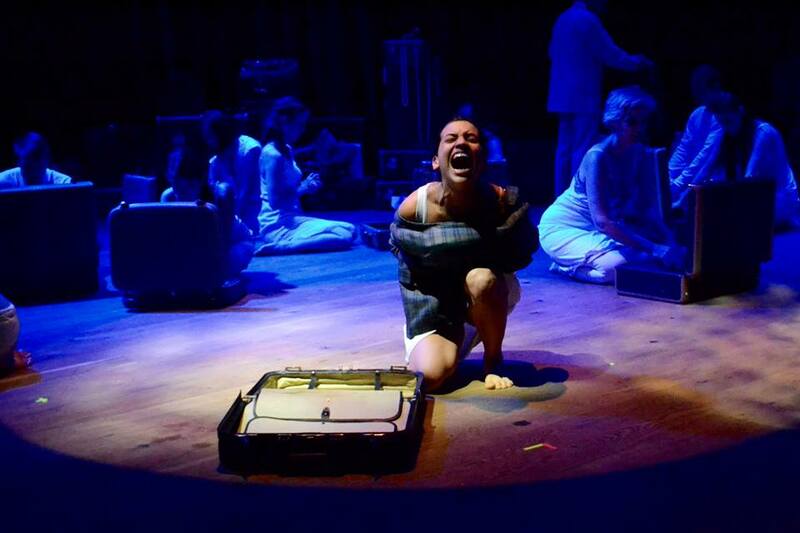 Suitcases is a show created and directed by Rosanna Saracino, directly inspired by the stories of the patients to whom they belonged. The contents of the suitcases are pieced together, resulting in an episodic production, as we see each character in turn (there are about 15 or 20 altogether) speak directly to the audience, or, in some cases, sing. There is a wide variety of characters, in the facility for various reasons, some of which seem familiar to us, others seem outdated. Some women, for example, are there because of past abuse, grieving for lost children or partners, and I was struck by the fact that they were in there at all. Others are more stereotypical, one constantly loses time, another speaks to ghosts, others have paranoia or delusions. The set consists of piles of suitcases, clothing racks, and various other personal items strewn around the edges of the stage, recalling the inspiration for the show and creating a sense of emotional and personal clutter, while also making the empty space in which the actors moved and told their stories seem even more stark by contrast. This is not a home, this is an institution. The lighting adds to this with its harsh white tones, particularly against the cold backdrop. The story moves between individual stories and collective movement. This helped fill out some of the atmosphere of the space, one in which they are all in something together, while also grappling with very individual histories, and even in the moments of collectivity there is still a strong sense of isolation. This piece is doing something really important, namely giving a voice to those who are not only forgotten, but who were not heard in the first place. The show is aiming at something necessary, and has a lot of potential. My main worry is that it still contains a lot of clichés about mental illness, which seems entirely antithetical to the show’s purpose. Metaphors about heaviness for depression, feeling stuck, feeling dragged down: these might be true, but giving more nuance to these feelings might give more dimension to those characters. Another man wanders around the stage bemoaning the fact that he’s ‘lost his mind’ because he cannot remember where he ‘last left it’. The scene is meant to be lighthearted, but comes off as dismissive. There are moments of choreography that aim to give a fragmented and stilted feeling to a few of the characters, but again, this seems to be reinforcing the caricatures of mental illness that are so pervasive and alienating. Other characters’ stories go in the opposite direction: they are told very poetically, but so much so that it’s hard for the audience to get a real sense of what’s going on, and a couple of times I wanted even just a tiny bit more backstory or dialogue to better contextualize a character’s emotional state. Overall, despite being rough in places, the show contains the seeds of something really fantastic. It’s a worthy project, artistically and socially, and definitely worth checking out.